A train driver died and four people were seriously injured in Catalonia on Friday when two trains collided head-on outside Barcelona, the rail company and emergency services said. 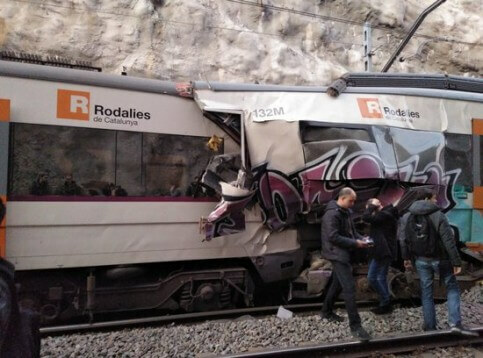 The crash occurred during the after-work rush hour, near Castellgali, between the towns of Sant Vicenç de Castellet and Manresa, some 50km from the Catalan capital, national rail company Renfe said in a statement. The collision claimed the life of a 26-year-old driver and severely injured four passengers, while another 100 suffered minor injuries, the emergency services said on Twitter. The train service in the R4 line was suspended, and at least eight ambulances were sent to the area. Renfe said an investigation was opened into the crash. In November, one person died and 49 others were injured on the same line when a landslide caused a train to derail.